AKIPRESS.COM - Sandwiched between China and Russia, landlocked Mongolia has long tread a middle path, maintaining a balance between Moscow and Beijing while referring to the U.S. and other remote allies as "third neighbors." Now, with a wealth of mineral resources set to transform its largely agrarian economy, Mongolia is moving to cement that even-handed status by adopting permanent neutrality as a safeguard against outside dominance, reports Associated Press. President Elbegdorj Tsakhia says the move would best serve a desire for peace, security and balanced foreign relations in the vast Asian nation of slightly under 3 million people, while boosting its global profile in international organizations such as the United Nations. Draft legislation on adopting that status was submitted to the legislature last week. Mongolia's permanent neutrality would "contribute to the strengthening of peace, security and development in our region and the world at large," Elbegdorj said in a speech to the United Nations General Assembly in September. The building blocks of neutrality are already in place, with Mongolia legally eschewing nuclear weapons and military alliances. Mongolian officials say that since the collapse of former sponsor the Soviet Union in 1992, the country has been de facto neutral, despite close relations with the U.S. that have seen it dispatch troops and instructors to Iraq and Afghanistan. The country has plenty of cause to be wary of encroachments by its immediate neighbors. China is the country's biggest economic partner, absorbing 80 percent of its exports and providing 30 percent of its imports, along with more than $3.8 billion in investment. Russia, meanwhile, provides all of Mongolia's energy imports. Bonds forged during the Cold War, when Russia dominated political life here, remain strong, with Mongolia abstaining from a United Nations vote condemning Russia over its annexation of Crimea. Neutrality would end Mongolia's low-level engagement with NATO and the U.S., as well as precluding full membership in the Shanghai Cooperation Organization, a regional political and economic grouping that seeks to limit U.S. influence in Central Asia and is dominated by Russia and China. Mongolia has reportedly been invited to join the bloc, although the Mongolian leadership has been cool on the idea. The law would permit Mongolia to retain its armed forces, and to join a military alliance in the event its sovereignty or independence was threatened. 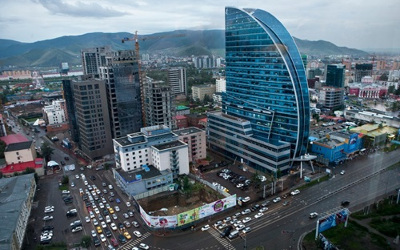 Yet, the move has little value unless China and Russia rein in their diplomatic and economic pressure on Mongolia, raising doubts about the significance of the exercise, said Enkhsaikhan Jargalsaikhan, Mongolia's former representative to the Organization for Security and Co-operation in Europe. Regardless, Mongolia seems intent on formalizing its neutral status following further dialogue between Elbegdorj and lawmakers and the passage of the necessary legislation. Foreign Minister Purevsuren Lundeg has already broadcast the country's intentions in visits abroad, including seeking neutral Switzerland's counsel.